I’ve just finished overhauling Wikipedia’s Netbook article which currently does a much better job of reflecting reality than it did previously. In particular, the term ‘Netbook’ pertains to connectivity (which is why all of them have WiFi and many of them are fitted with 3G chips) and has nothing whatsoever to do with size. Notebooks on the other hand were all about size. Introduced in a time when a laptop was (by definition) anything you could fit on your lap, Notebooks were much smaller – about the size of a paper notebook. Certain vendors would love you to believe that a Netbook is confined to form-factors less than 10 inches (which is largely useless for business productivity applications) and insist that you’ll soon need to run Windows 7 on an Intel Core 2 Duo or Quad to be productive. Unfortunately for them the reality is that thanks to almost-ubiquitous connectivity and supporting cloud computing services, these devices are more than adequate for most purposes. Including business. And why wouldn’t business want a disposable device that lasts 5-10 years, can be bought at the supermarket for a few hundred dollars and that works out-of-the-box? Forget about imaging, drivers, updates and standard operating environments – the bundled software (like Mac OS X) is ‘moulded’ to the hardware, which is itself a moving target. You’re much better off to let the hardware vendors do their job and focus on adding value via the Internet accessible services you deliver to your end users. Like it or not, full featured Netbooks are here, and with them a new era of computing – at least for those who have the systems in place to support them (e.g. terminal services, VDI) and/or the agility to migrate to cloud computing (e.g. Google Apps, [Sales]Force.com). It’s only a matter of time until someone introduces an affordable, full-sized (12 inches or above) business grade netbook and then it’s pretty much game over for the Notebook – even I would think twice about the next MacBook refresh if there was a netbook equivalent. An Asus Eee PC netbook. 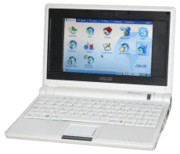 A netbook is a class of laptop that is light-weight, cheap, low power consumption and optimised for wireless communication and Internet access. Hence the name netbook (as “the device excels in web-based computing performance”) rather than notebook which pertains to size. Primarily designed for web browsing and e-mailing, netbooks “rely heavily on the Internet for remote access to web-based applications” and are targeted increasingly at cloud computing users who rely on servers and require a less powerful client computer. While the devices range in size from below 5 inches to over 12, most are between 7 and 11 inches and weigh between 2 and 3 pounds. The influx of small form factor laptops categorized as netbooks began in 2007 when Asus unveiled the Intel Celeron-based ASUS Eee PC. The 8.9 × 6.5 in (23 x 17 cm) device weighed about two pounds and featured a 7-inch display, a keyboard approximately 85% the size of a normal keyboard, a custom version of Linux and the ability to run alternate operating systems. Following the EeePC, Everex launched its CloudBook in mid February 2008, MSI released the Wind, Dell and HP both released “Mini” series (the Inspiron Mini and HP Mini) and others soon followed suit. By late 2008, Netbooks had begun to take mind share away from laptops and overtook iPhone sales by 900,000 units in Q3. It is estimated that almost thirty times more netbooks were sold in 2008 (11.4 million, 70% of which were in Europe) thank in 2007 (400,000) and for 2009 sales are expected to grow a further 189% to 21.5 million. Sales are projected to increase up to 50 million by the year 2012. The trend is being driven by cloud computing and 3G adoption as well as the economic downturn and netbooks are evolving into “super-portable laptops for professionals”. Early January 2009, two companies introduced ARM architecture based models, indicating a shift from the Intel Atom processor. Led by the popularization of small-form-factor laptops by Asus and then others, the term ‘netbook’ became a widely used and genericized industry classification rather than a reference to a particular product. By April 2008, Intel had begun officially using the term netbook to recognize a specific sub-category of laptops. Psion have various trademarks for the term netbook (including U.S. Trademark 75,215,401 and Community Trade Mark 000428250) relating to their “netBook” series that was discontinued in November 2003. Despite prior use of the term dating back to at least as far as 1989 (U.S. Trademark 74,001,501) and having neither used the (now generic) term nor enforced the trademark in over 5 years (after which time it can be considered abandoned for non-use) a batch of cease and desist letters were dispatched on 23 December 2008. Similar applications by MSI (U.S. Trademark 77,580,272) and Coby Electronics (U.S. Trademark 77,590,174) have been recently rejected by the USPTO citing a “likelihood of confusion” under section 2(d). While specifications and features of netbooks continue to evolve (for example with the introduction of 12-inch screens and ARM processors), one report at the end of 2008 suggested the typical netbook featured a 3-lb (1.4 kg) weight, a 9-inch (23 cm) screen, wireless Internet connectivity, Linux or Windows XP, an Intel chip, and a cost of less than US$400. Netbooks may also forgo a hard disk drive or optical disc drive, instead favoring solid state storage devices such as internal solid-state hard drives and SD cards for their low power consumption, weight, and high durability. All netbooks on the market today feature Wi-Fi wireless networking and many also feature mobile data capabilities such as 3G. The two main operating systems shipped on netbooks are various netbook-specific distributions of Linux (e.g. Ubuntu) and Microsoft Windows XP. Between one in three and one in four netbooks run Linux, which is almost two orders of magnitude higher than its share on traditional devices but still less than half that of Windows XP (which Microsoft estimate runs on 70% of netbooks). Microsoft have extended availability of Windows XP for ultra-low cost personal computers from June 2008 until June 2010, possibly to avoid netbooks from gaining market share at the expense of full-featured desktops and laptops and avoid increased use of Linux installations on netbooks. Microsoft is also testing and has demonstrated a version of Windows 7 for this class of devices. Advanced users may install other operating systems (including other distributions of Linux, editions of Windows XP and Mac OSX) or application software, but users typically rely on cloud computing applications and services which are available via the Internet and require less powerful hardware on the local computer. ← Major Google App Engine 2.0 update (Java, cron, billing) in the pipeline?